2018 marks an important milestone for Welden & Coluccio Lawyers. Just four years ago, our firm was born out of necessity. We didn’t like the way “big law” did business and vowed to start a practice that treated clients like family instead of numbers. We didn’t splash our names on billboards. We weren’t aggressive marketers. We knew that the quality of our work and our relationships with our clients would be the foundation of a successful legal practice. All we had was our professional expertise and a plan. By the end of that first four years – if we were still in business – our dream was to hire another lawyer, expand into family law and lease a room in a second office. That was the dream. Four years. We reached that milestone in nine months. Now, the next chapter in our story unfolds as we move into our new purpose-built home on Grange Road. Our state of the art facilities give us room to grow, and will allow us to embrace the future of business, and expanded board room meeting facilities reflect our growing influence in the area of commercial law. Not only does our new office give us permanent roots in the western suburbs, but it provides a base as our client list expands north into the Barossa and Upper Spencer Gulf. We’re proud to be planning our flag in the Western Suburbs, but our Prospect office will always be special. It’s where this business was born. We didn’t even have desks, and worked on garden furniture on the first day, but the community embraced us regardless. That’s why we’re retaining our office space at 194A Prospect Road, alongside our extended business family in Senexus Aged Care Solutions. Importantly, our new premises on Grange Road gives us the opportunity to grow our relationships with the city’s business community, and we welcome Mortgage Choice, GF Accountants and MPL Wealth Management who will share our new home with us. On this, our fourth anniversary of business, we invite all our valued clients to visit us at the new Western Legal, Wealth and Finance Centre on 179 Grange Road, Findon, to discuss your evolving estate planning needs. 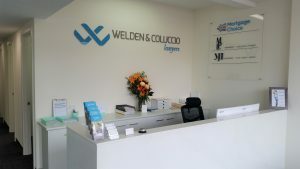 Our new reception area; discrete and comfortable. Even though your wait is short, you’ll feel at home in our new offices. Our new vault: Your precious documents have never been safer. 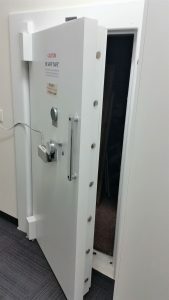 Our new office started life as a bank, meaning we have a bank vault on-site for the storage of your wills, deeds and other valuables. Add to that 24/7 monitored security and Welden & Coluccio is the safest bet for secure deed storage. 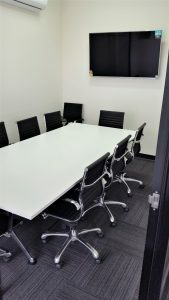 Our new boardrooms are spacious and modern, to facilitate meetings of up to 16 people (including video conferencing capabilities). This reflects our growing influence in the areas of commercial law, franchising and trust administration.